-Facial Characteristics: Long Black Hair, A perfect nose, sea blue eyes, and full luscious lips, often turned into a sneer. -Not Afraid of the Depths - Due to her connection with Besmara, Ariana is gifted with both the ability to hold her breath for an extended period of time and she is also a gifted swimmer. -Inner Light - Regardless of her personal alignment, her celestial backgrounds make her resistant to negative and necromantic energies. 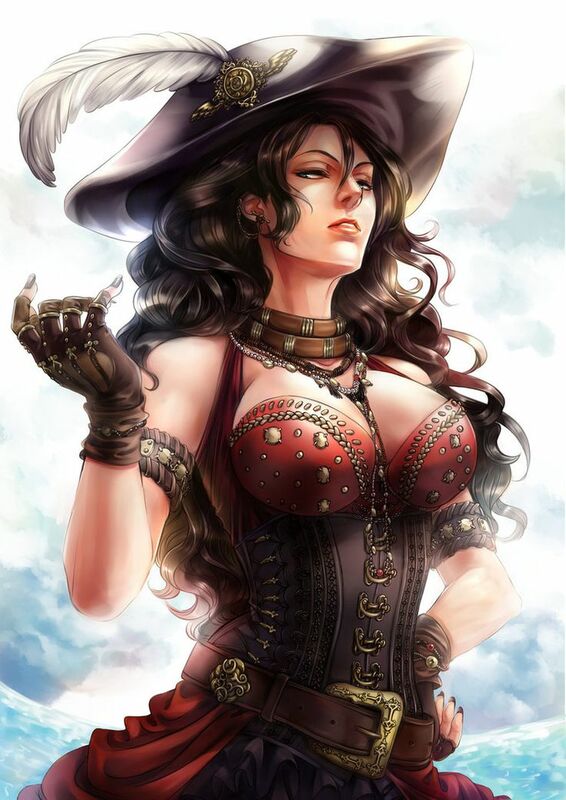 -Power hungry, and possessing a great desire to regain a ship, to resume her piracy. -Calm, cold, and calculating, with a mischievous and vicious streak. -History: Ariana was born to a poor laborers family. Her parents.... looked at her like a burden, another mouth to feed. By the age of 8 she was sold to a prostitution ring to pay off her parents gambling debts. She was taught many things, while also being subjected to things no child should. She learned to dance, to please, to listen, and to entertain. Her beauty blossomed early, and that is what captured the eyes of the notorious pirate captain The Lord of Waves. He purchased her for a hefty sum and had a personal.... cabin slave in all of his forthcoming voyages. Over the years, she learned many more things, how to fight (mostly to fend off the advances of the crew), how to sail, how to read a map. More importantly, how to lead, how to inspire fear and loyalty. The Lord of Waves was a great pirate, but a horrible person. As she grey older, she became more and more a confidant of her captain and owner, and she was given more and more authority, eventually as his second in command. So much so, that when he died, (under somewhat mysterious circumstances) that she maintained control of he ship, 'The Trident'. She became a notorious pirate in her on right, just up until the kingdom of Markh put a bounty on her head. Three privately owned vessels, though merchant marine, ambushed the Trident near a hidden bay. Pinning it against the coast, they blew the ship to pieces. Ariana's body was never recovered, but she was presumed dead. With her divine connection to Besmara, she was able to survive. Washing up on an island she was taken in my an old couple and nursed back to health. Since then she has taken on work as a mercenary, trying to find some way to acquire a new ship, get a new crew, and return to piracy, while nursing her new found hatred for Markh. -Skills: Create Five Specific to your class. -Dancers Grace - Due to her dancers training, she is incredibly graceful, to the point where she dances around the battlefield, avoiding blows and delivering them in return. -Fencing Grace - In learning to defend herself, she found that she was a virtuoso with the blade. -Lineage of the Lady of the Ways - Her relation to Besmara grants her many boons, mostly in small ways. The currents and winds are almost always in her favor, storms veer around her, most sea monsters avoid her vessel. *APPROVED, Need a form change decision on skill as will be discussed in treehouse due to forgetful Jack error.